One of the hallowed objectives for the framers of the Constitution and the first government was the need to ameliorate the inequities that existed prior to independence; reduce and eliminate the differences among people and communities ingrained due to inherited prejudices and resultant societal hierarchies, and economic disparities between communities there of. All governments, be it State or Central, till date, have been grappling to achieve these objectives. Over the years, successive governments have pushed a combination of measures, involving both public and private, with mixed results. One of the most important aspects of this change was the need to change attitudes and the way people and society responded to the growing societal and economic challenges. Inequities in wealth distribution across individuals, communities, organisations and nations have existed since time immemorial. Often, individuals and organisations have been accused of engaging in economic activity; with profit being the sole motive. They have been charged with negligence towards societal concerns such that no thought is applied to the methods used to garner such wealth nor understand the impact of their actions on people and society at large. This attitude largely has been more of a rule rather than an exception in the past. While there have been exceptions to the rule, these examples were more so due to personal and religious beliefs manifesting in forms of charity and philanthropy. These activities are involved in financial contributions to the distressed as charity and sometimes promoting members of one’s own community by aiding education and business opportunity. With the passage of time and growth in economic activity, certain individuals, communities, organisations and nations have propelled themselves and excelled in wealth accumulation. This in turn has resulted in a lopsided development and a growing discrepancy in the economic spectrum. Further, the effects of such unequal growth have not only resulted in structural inequalities but also in societal and environmental implications. Fortunately, there is an increasing recognition of this lopsided growth and representation and a movement towards rectifying and reinstating semblance in the social order. Today, more and more individuals and organisations are beginning to give back to the society at large. What was initially limited to a few individuals and organisations is now attracting larger involvement, participation and commitment. However, this activity is largely spaced-out and not channelised to measure quantifiable results. In India, the government enacted Section 135 of the Indian Companies Act prescribing a mandatory CSR spend of two percent of average net profit during the three immediately preceding financial years for all companies meeting specified financial thresholds. In other words, companies having net worth of rupees five billion or more, or turnover of rupees ten billion or more, or a net profit of rupees fifty million or more during any financial year have to ensure that they spend two percent of average net profits made during the three preceding years on CSR activities. · Rural development projects, etc. Slum area development. Explanation: For the purposes of this item, the term ‘slum area’ shall mean any area declared as such by the Central Government or any State Government or any other competent authority under any law for the time being in force. Further with an aim to broad-base the implementation of such schemes and reachout to a wider hinterland, the CSR Policy mandates that such activities should preferably be initiated in areas where the company operates i.e. local areas. The CSR Policy Rules mandates the establishment of a CSR Committee which will be empowered and responsible for the preparation of the CSR Policy in which it includes the projects and programmes which is to be undertaken, organise a list of projects and programmes which a company plans to embark on during the execution year and also focus on integrating business models with social and environmental priorities and process for the reason of creating shareholder value. As a growing economy with a large population, there is immense pressure on equitable allocation of scarce resources. This in turn has led to a number of social and economic problems. Hence, companies can choose from a wide range of issues for their CSR activities. 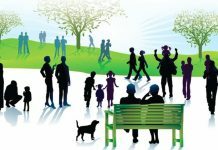 While many believe that companies should choose CSR projects related to their businesses to ensure sustainability of CSR implementation as the benefits and outcome can be measured and further encourage companies to spend more on CSR programmes, the moot question however is the criteria for choosing a particular kind of activity. One of the pertinent questions deliberated frequently by researchers is whether CSR activities of a company should focus on social issues linked to the company’s main business activity. Companies have been choosing different issues including education, medical care and development of rural areas, sanitation and empowerment of women. Some companies choose the social issues for CSR activities based on the impact of their business and the interaction with various stakeholders, but most of them work simultaneously on multiple social issues. · Health programmes on dental hygiene in elementary educational institutions by Colgate-Palmolive. · Women empowerment activities in rural areas to help women learn selling skills and opportunity to make livelihood by Unilever’s micro enterprise programme-Shakti. · Education on nutrition to adolescents through Nestle’s Healthy Kids Programme. · Feminine hygiene education to help adolescent girls adopt the right practices by P&G’s Parivartan – The Whisper School Programme. · Public social message on civic rights and women empowerment by Tata Tea’s Jaagore campaign. · Assistance to farmers to sell their produce by eliminating middlemen through ITC’s e-Choupal initiative. 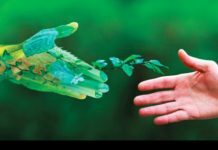 It has been found that many companies, especially in financial services and IT industry, tend to choose CSR activities not related to their business. Few examples are rural development focus by Deshpande Foundation, focus on child education by Azim Premji Foundation and cultural heritage conservation by Indian Oil Corporation. As per Karmayog CSR Ratings, environmental-related activities like energy efficiency and waste management were the focus areas of nearly 26 companies across India. An understanding of the reasons fort his variation leads us to the fact that the nature of industry sector in which the companies operate influences their CSR approach. It is interesting that the top 15 spenders are from industries like mining, energy and manufacturing industry which use natural resources like coal, oil, iron etc. on a large-scale basis. Obviously, these companies have to compensate and rehabilitate people displaced because of the operations of the company. 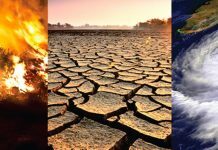 Likewise, they are obligated to spend huge amount of financial resources on treatment of effluents, pollution control mechanisms, reforestation and other sustainable business practices. 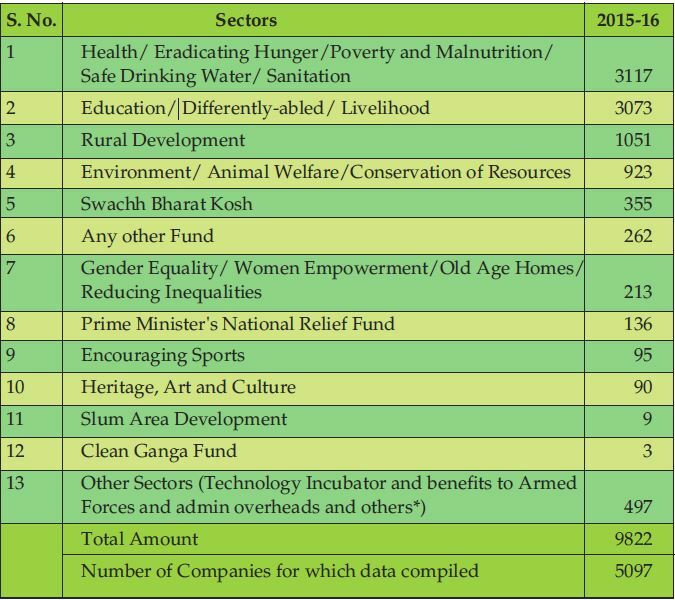 As these spends are included in CSR activities, the overall CSR spends appears higher. 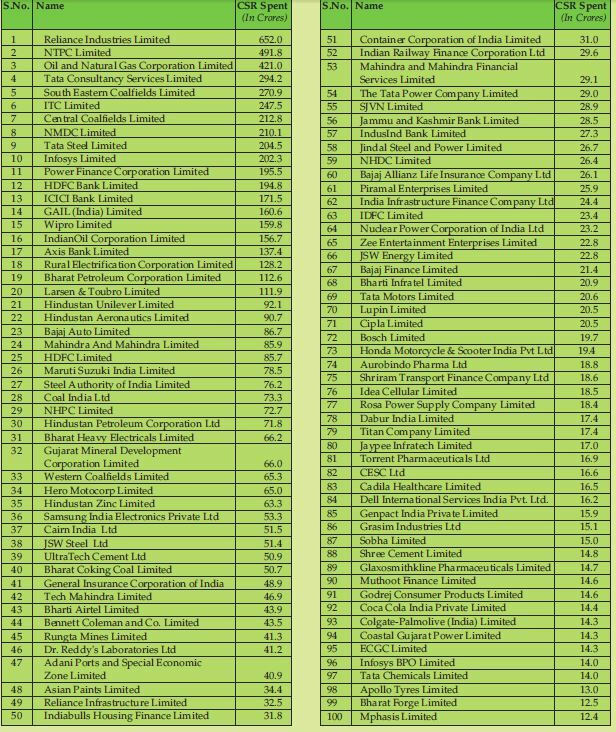 Another study by ASSOCHAM Eco Pulse on CSR by Indian Companies (2009) found that companies related to chemical and fast-moving consumer goods top the charts for the sheer number of CSR activities. Companies in the Chemical sector are leaders with 12.11 percent contribution of CSR activities which have focus specially in environment and education areas. They are followed by FMCG companies whose share is 10.15 percent of CSR activities with focus on welfare of community and education. 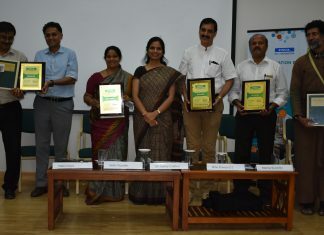 The trend of Indian corporations focusing on certain themes in their CSR spends depict that there is a growing awareness of the importance of returning part of the profits for the welfare of the larger society. This in turn helps in reinforcing the organisation’s reputation and customer loyalty. Companies are moving from just compliance towards responsible behaviour as more and more shareholders are encouraging them to do so. The ‘India CSR Outlook Report (ICOR), an annual research publication of NGOBOX, which conducts an in-depth analysis of CSR spend of big 300 BSE companies in previous financial year (FY 2016-17) has revealed some interesting insights in CSR spending trends. · Skills development projects received five percent while Swachh Bharat-related projects received 7.3 percent of the country’s CSR spend. CSR has come a long way in India. From responsive activities to sustainable initiatives, corporations have clearly demonstrated their ability to make a significant difference in society and improve the overall quality of life. Effective partnerships between foundations, industry, NGOs and the government will place India’s social development on a fasttrack Needless to say, CSR activity by the corporate sector is playing an ameliorating role in addressing the growing needs of society, and has demonstrated a strong support to the government’s commitment to reduce inequities among people and communities. While these are measurable and commendable steps by the corporate sector, more needs to be done.